So this is more of a personal post today and it's something I've wanted to speak about, whether this is out loud or in writing, for someone to read so I can let our everything that's basically going on in my head and that's what my blog is perfect for. Something I have always been able to control is the jobs I go into and my happiness when I'm in that specific job. For nearly all of my teenage years I was unhappy, depressed and at a very low point in my life and at the time, I couldn't really change that. I was stuck in school, I couldn't get away from everything that was going on in my life, and when I managed to change schools I had the same situation occur so I went back to the school I was used too. However, this didn't mean the situation didn't go away when I went back, it was still there. When I managed to get away from school after I finished my GCSE's I was so relieved because I had the opportunity to start fresh. To go somewhere where no one knew me and could see me for who I am. To be completely honest, everything went well in my first year. Obviously you can't please everyone and there will always be someone who doesn't like you, but I was okay with that. Although, in my second year everything turned upside down and my past from school relived itself, but in college instead. I am now completely happy at University, I still have them one or two girls that don't like me, but still, this is okay. This will happen everywhere. But while being at University, I need to have some sort of income and this is where a part time job comes into place. As part of my degree, I have to be in some sort of placement within the childcare sector for 14 hours a week. I tried so many different nurseries and it just didn't appeal to me. I didn't like how as a childcare play worker you just sat around, ensuring the children are safe while they played. I needed some sort of purpose, something to be constantly doing when I am at work. After a month into my degree, I started my placement at my old primary school after their Ofsted report improved. I was so relieved because it's the one place I can happily say I enjoy going too. Unfortunately, this was an unpaid placement meaning I still didn't have an income. In January this year I started working at a before and after school club as a play worker, where I basically acted as a manager for the whole four months I was there. This was another job that I was so happy being in because of what it involved me doing. However, I couldn't stand my boss and I weren't happy going to work whenever she was in. Although my placement then hired me in June, I desperately needed a job for the summer and after a ridiculous amount of interviews, I was then employed by Empire Cinemas. While working at the cinema, I was able to enjoy the benefits of working there; free movies, eight tickets a month for my friends and family, 50% off behind retail, and 25% off in front of retail. The benefits of working there were brilliant and to be honest, this was why I took the job, even though it was minimum wage. I handed in my availability form two weeks ago ready for when I go back to the school, and the cinema weren't impressed with the hours I could work. But the thing is, when they employed me they knew I had commitments come September. My boss spoke to me and expressed that he didn't want to lose me from the company, but I needed more availability than what I put down, and I couldn't meet his needs. From this moment, my happiness decreased so much in the space of a week. When it came to my next shift, I was crying nearly all day, I was definitely an emotional wreck. Alongside my boyfriend going away for four nights and the typical female hormones, I had absolutely no idea what to do with myself and I was so unhappy with everything that was going on in my life. I took this opportunity after speaking to so many people to leave my job at the Cinema. What I began to realise was although I had an income coming in to pay for my car insurance, fuel etc, I weren't happy. 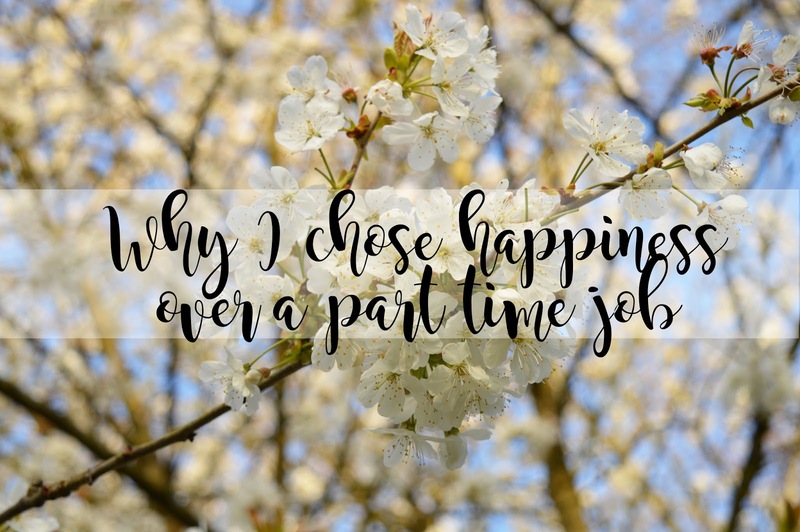 I was letting a part time job effect my happiness, and my life in general and I knew I was able to change this, because it's a part time job and somewhere I wouldn't be working for the rest of my life. As well as this, it meant I had two weeks to get my life together, do anything I wanted to do before going back to work at the Primary school, the one place I loved to be and couldn't wait to go back. For me, this was an eye opener, why spend your time in a place where you're unhappy, when you could be spending it somewhere else which makes you feel absolutely amazing. The purpose of this post is to share with everyone, whoever is actually reading this that you do not have to let a part time job effect your life and your happiness. You have the opportunity to make changes to anything that is not making you happy, it's just taking the time to realise this. "You are always one decision away from a totally different life." Thank you for taking the time to read my thoughts. The world is lifted off my shoulders. Also, if you're in a part time job and you're unhappy, leave & do something you love! This was such a beautiful post to read. I've been in a similar position before where I was so unhappy but it took a lot for me to leave, I'm so happy that you made this decision though! Great post! I so agree with you, don't be in a place that makes you really unhappy. I don't that with working at NEXT and my depression just worse day after day. I'm glad you left the place that made you feel like that. Happiness is the most important thing. And you should do what makes you happy rather than worrying what other people think (something which I'm trying to do myself). You've taken the time to experiences new changes in your life, adapting to different environments, and seeing what's for you. Best of luck with everything else you choose to do.